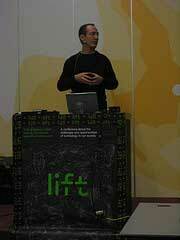 Founding member Christophe Guignard speaks for fabric | ch during Lift 2007 in Geneva. Subject of the talk: Contemporary space(s). Lift07 day two is long and extremely stimulating. There are just too many great talks by super smart people. If you'd like to follow what's going on at Lift in french, le team de InternetActu is blogging the event en français. Christophe Guignard, one of the founding members of fabric | ch, an architecture studio based in Lausanne, Switzerland, gave one of the talks that interested me most. Titled Architectural Contemporary Space(s), it was an introduction from an architectural point of view on how space is transformed by technology and other processes. He illustrated the point very simply with a picture he had taken on holiday. On the same image there was the Parthenon, traces of airplanes passing through the sky, people taking pictures or fiddling with their mobile phone. The ancient Greek built temples for gods that reproduced the laws and proportions that rule the cosmos at human scale. But today the relationship between architecture and space is much more complex. New situtations and elements emerge that lead to new architectural situations and possibilities: mobility, networked communities, understanding of Earth as a unique space, 24/7 working time, etc. Below some emblematic images that embody this idea: ski slopes in Dubai, flight simulation, the electro-magnetic spectrum, people writing messages on the surface of the Earth to be seen by satellites, simulation of weather, etc. These systems are not independent from one another, they overlap and interfere. They also demonstrate that our environment is not static anymore, it's going beyond the dimension, it's giving life to what Christophe Guignard calls an "ex-dimension" architecture. Le Corbusier defined architecture as a playful game of volumes under the visible light. Now architecture is much wider than that. There's no truth anymore about architecture but some fictions. 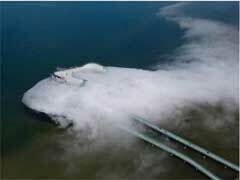 The Blur building by Diller & Scofidio, Swiss national expo 2002, Yverdon-les-bains, Switzerland. Architecture of water and humidity. Philippe Rahm's Hormonorium was based on the idea that understanding the physicochemical mechanisms that govern organisms brings about a change in how we understand space, and thus in the way we inhabit the environment. The Hormonorium featured an alpine-like climate, and thus its light is much brighter and it contains less oxygen, just like when you're at altitudes of about 3000 meters. The floor is made of 528 fluorescent tubes, which emit a white light that reproduces the solar spectrum, with UV-A and UV-B. This very bright light of between 5,000 and 10,000 lux stimulates the retina, which transmits information to the pineal gland that causes a decrease in melatonin secretion. Visitors were thus supposed to experience a decrease in fatigue, a probable increase in sexual desire, and regulation of moods. Besides, the oxygen-rarefied space caused a slight euphoria due to endorphin production. Hormonarium and the body reactions it created show that architecture is more than what the eye perceives. - Real Rooms, peripheral architecture for the Nestlé World Headquarters in Vevey (near Geneva). This concept aimed at reflecting the fact that Nestlé is a company that works 24/7 on 5 continents, that continuously exchanges data and goods, its workspace is global. Like any big company his administrative building are regulated by air co in order to get what is regarded as a "comfort of space." 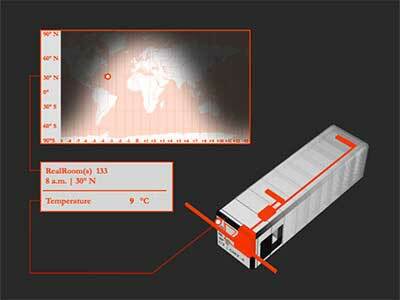 The RealRoom(s), informed by atomic clocks, luminosity, heat, pressure and humidity sensors, are distributed across a space representing the entire globe (one RealRoom per time zone, on 0°, +/-30°, +/-60° and +/-90° latitude). These RealRoom(s), connected permanently, directly recreate in an artificial but perceptible way, a global "terrestrial spatiality" fitting to the scale of Nestlé in 2005. One of their latest projects, Perpetual (Tropical) Sunshine, was reproducing the heat and light of the sun from the Tropic of the Capricorn into Northern atmospheres. The work plays with space, timezones and climate, but also with the interface between global and local, reality and virtuality. The system grabs information from weather stations and goes randomly to places where the sun is shining to produce a never-ending abstract summer. Fabric installed Perpetual (Tropical) Sunshine in several cities in the North of Europe. 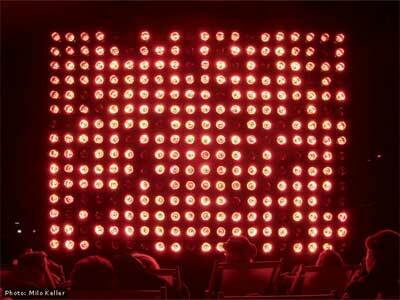 The screens of the installation are built with infra red bulbs so they actually heat the place. The screen are not merely visual, they are also sensorial. The most striking thing was to observe the way people were behaving in front of the installation, standing under the rain to watch the abstract sunshine. 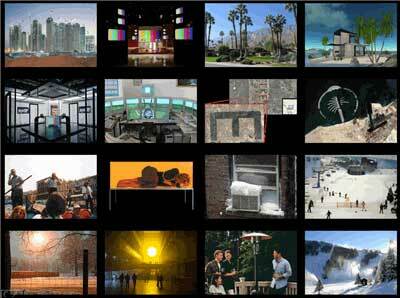 These examples should open new ideas to create other fictional spaces.